By Andrew Liszewski on 02/28/11 • Leave a comment! Don’t like wearing a watch?… Or um, carrying a cellphone? Or looking up at a bank sign, or any kind of digital display for that matter? Well you don’t have to worry about awkwardly asking strangers for the time as long as you carry this sundial-like parasol. 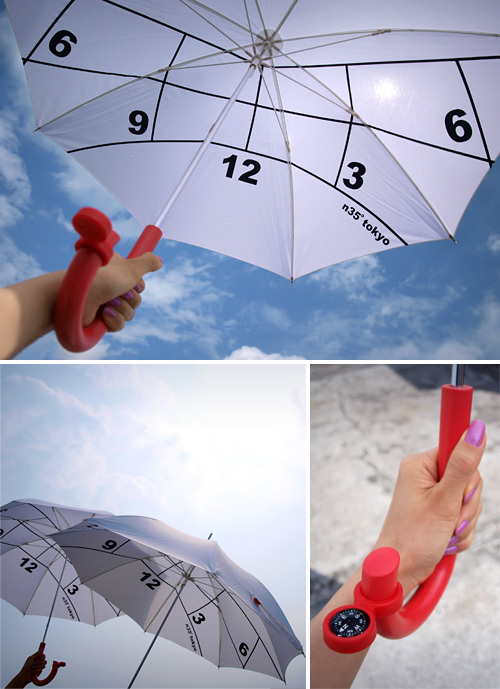 I’m pretty sure the designer, Kota Nezu, specifically refers to it as a parasol instead of an umbrella since using it to gauge the time is dependent on being able to find the sun in the sky, which isn’t always that easy on a rainy, overcast day. Like with a sundial, calculating the time requires you to know where north and south lie, so there’s a handy compass attached to the handle if your outdoor skills aren’t up to the task. You basically position yourself so that north points at you, and south points at the 12 on the number/grid pattern printed on the underside of the parasol. The vertical lines of said grid indicate the hours, while the horizontal lines indicate the Summer & Winter solstice and the Spring & Autumn equinox. So roughly gauging the current time simply requires you to find where the sun shines through on the grid. The Clock Parasol does appear to be available for sale too, starting at ~$35 (€25) though only for distributors and retailers which you means you can’t just buy one.